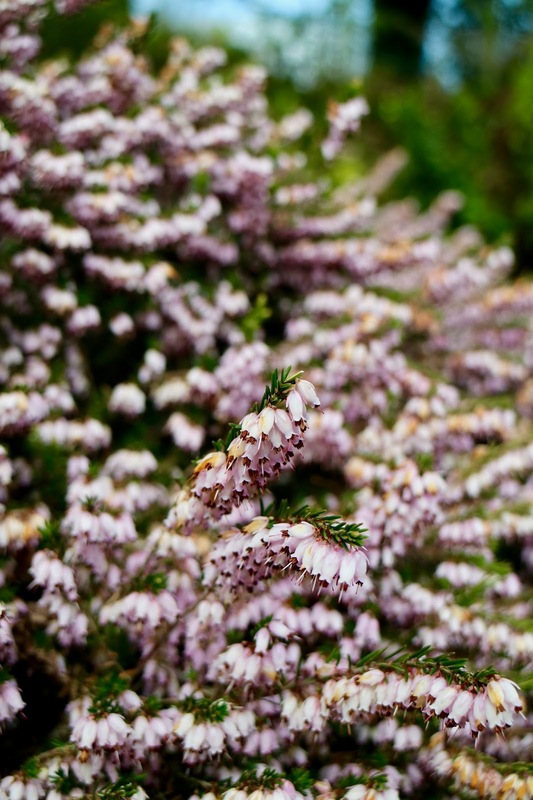 We're incredibly lucky down here in Cornwall to have been able to both create and maintain quite a wild and roaming garden filled with lots of native blooms. My mum is an avid bee-lover (so much so that we even fostered two beehives for a bit when we first moved in!) so she's made a special effort in the garden to pick plants that will encourage lots of buzzy activity. 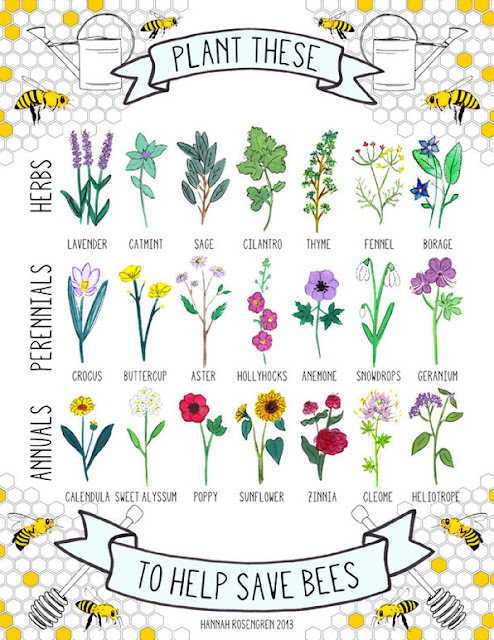 Bees and butterflies really like a good mix of flowers such as bluebells, buttercups, hyacinth, clover, garden mint, knapweed, thistles, blackberry bushes, heather, lavender and willow-herbs, among many other plants- so, if you want to encourage wildlife in your garden, be sure to plant a few of these! 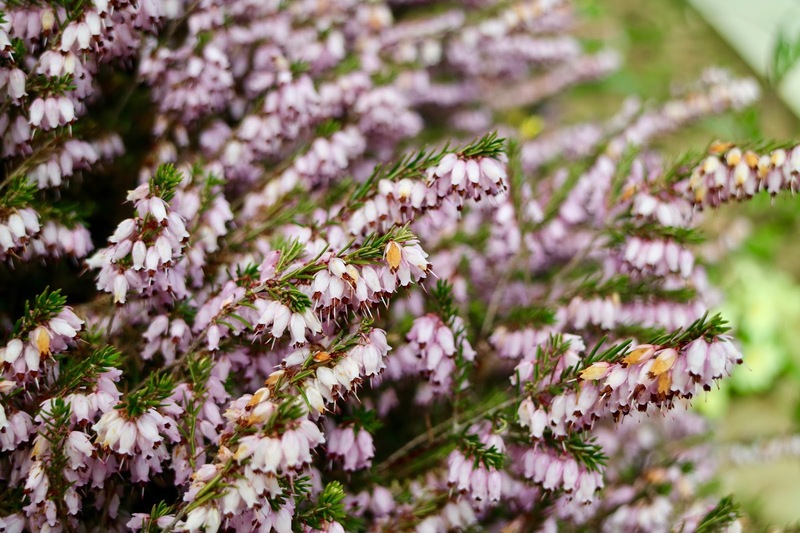 There's our crop of gorgeous-coloured heather... a popular spot for chubby bumblebees! Plus, here's a clear and helpful guide to wildlife-friendly planting from super-talented painter and illustrator Hannah Rosengren. You can grab one of Hannah's prints for future reference here. 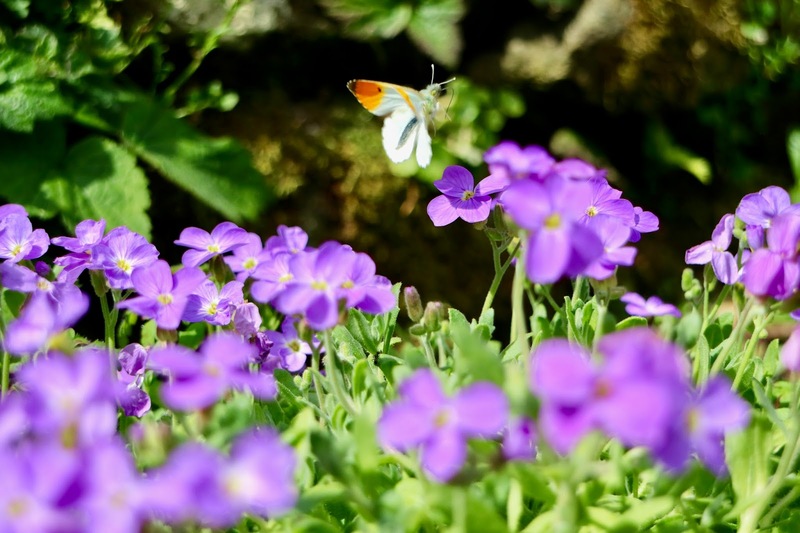 Planting the right kind of flowers to encourage lots of different pollinators is obviously an excellent way to help wildlife thrive in your garden but there are a couple of other things you can try to support your local buglife community. 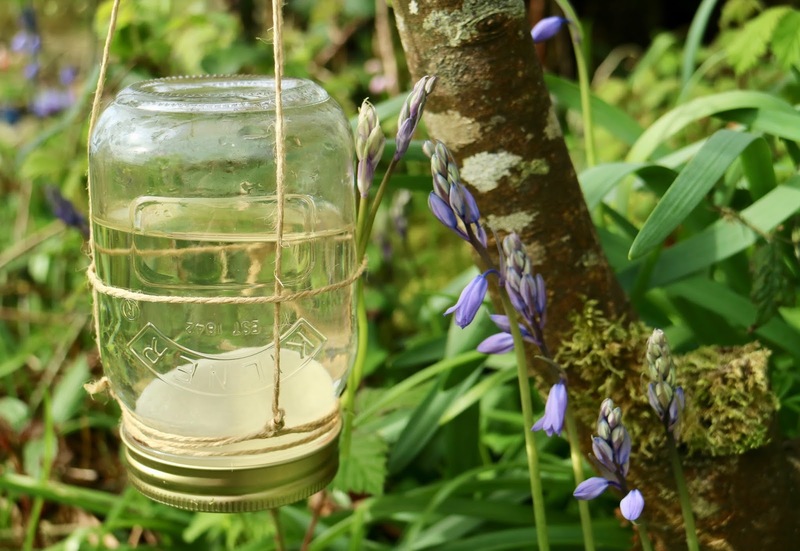 For example, did you know that in late Spring and early Summer the natural nectar resources that bees and butterflies rely upon to survive is in short supply? A lack of available nectar often results in a dip in pollinator numbers and, in recent years, both bee and butterfly populations in Britain and North America have suffered substantial losses at this time of year. As well as dwindling amounts of bee colonies, there are now over 20 species of endangered butterflies in North America and an incredible 56 varieties at risk in Britain and Ireland. 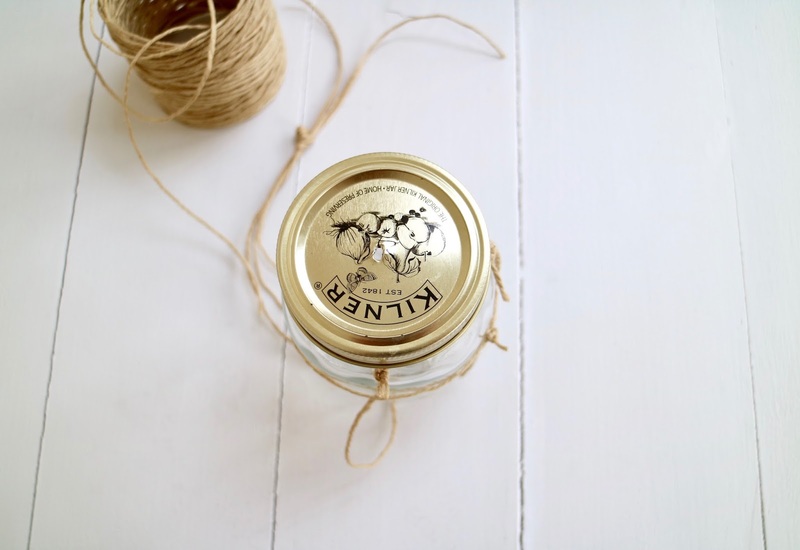 Start by cutting three, 60cm lengths of twine and tying each one around the neck of the jar. 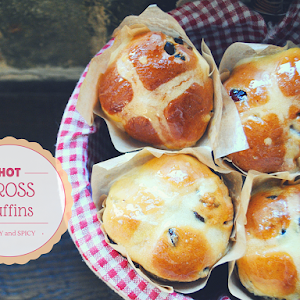 Spread the knots out so that they're equidistant from one another. 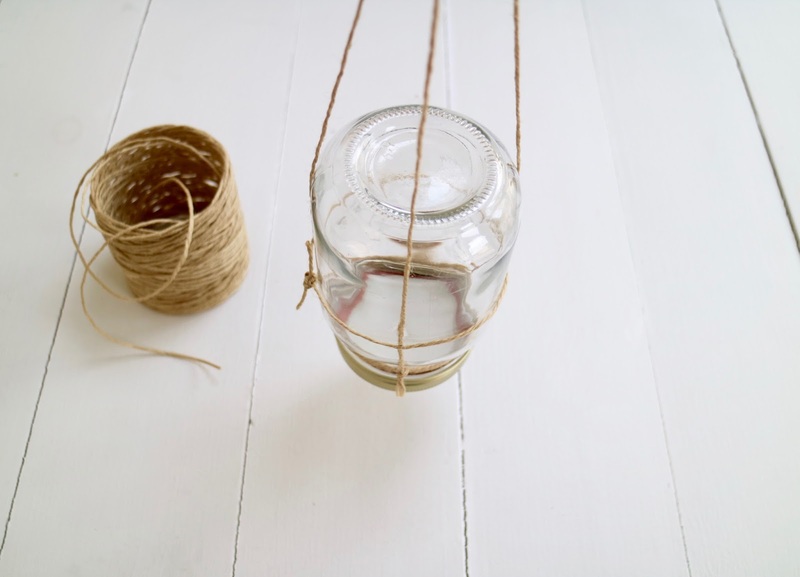 Turn your jar upside-down and hold it by the three separate strings. 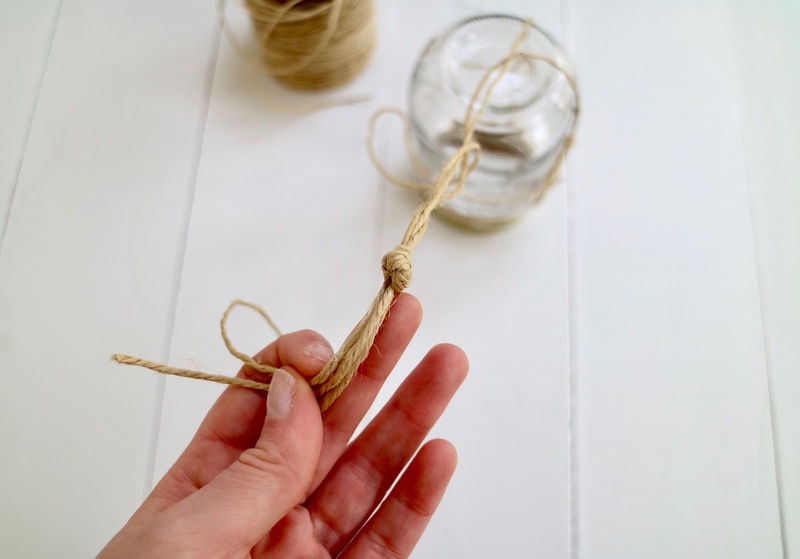 Grab an extra pair of hands and get them to tie a fourth length of string around the middle of the jar to keep everything secure. You should end up with something like the contraption above! 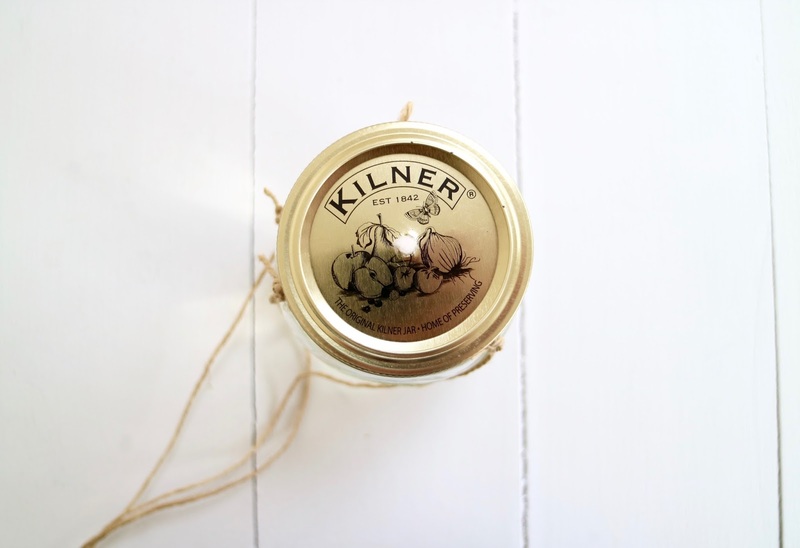 Remove the jar's lid and, using a large nail, hammer a small hole in the top. 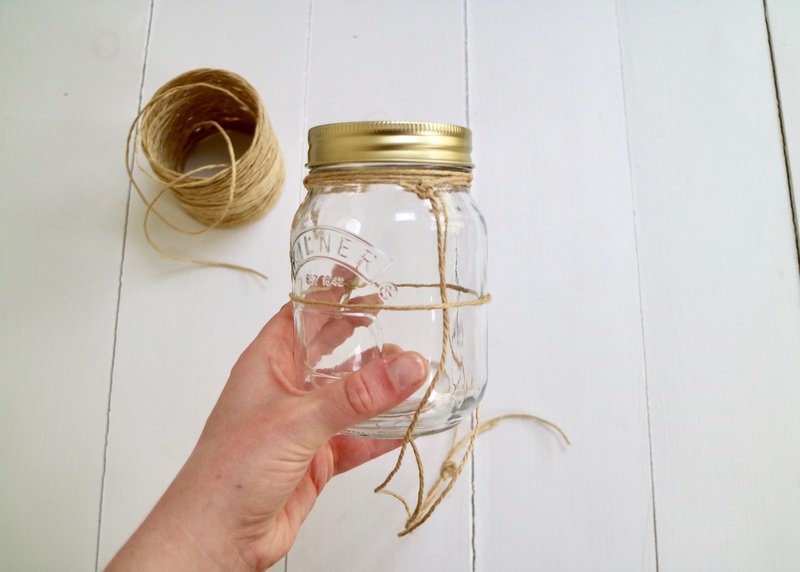 This will act as your jar's 'drip-feed'. Tie the three strings together at the top. 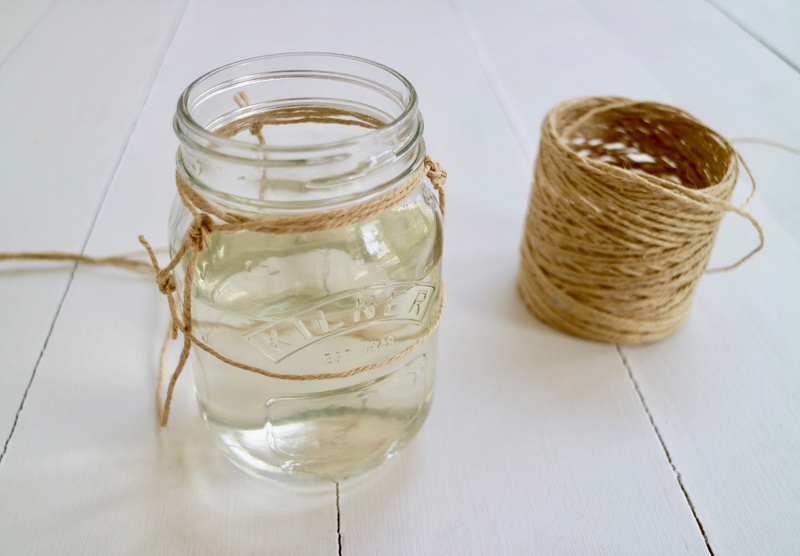 Make a simple sugar solution by mixing two parts sugar to one part water. It's very important that you stick to this ratio when making up your syrup as bees and butterflies can become very ill if they have too much sugar! Pour the syrup into your jar until it's 3/4 full. Push a cotton pad (or two, if you can get them both to fit!) through the small hole you made in the jar lid. 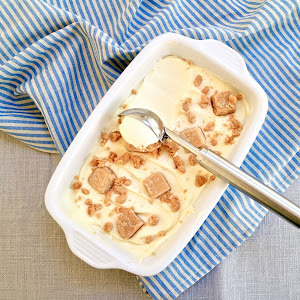 Screw the lid back onto the jar and you're ready to go! Here's my little feeder sitting quite comfortably amongst all the greenery! 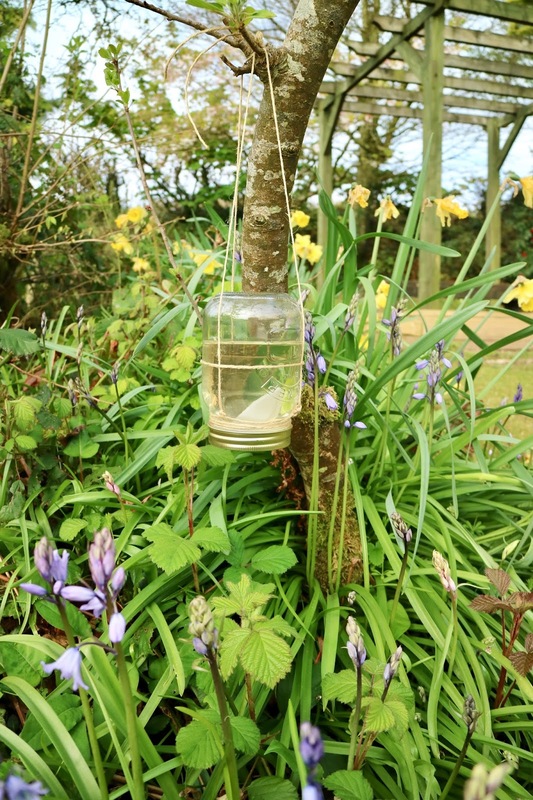 When you come to hang your feeder, be sure to choose a warm spot near a colourful crop of flowers as butterflies and bees will naturally come to investigate clusters of bright blooms. 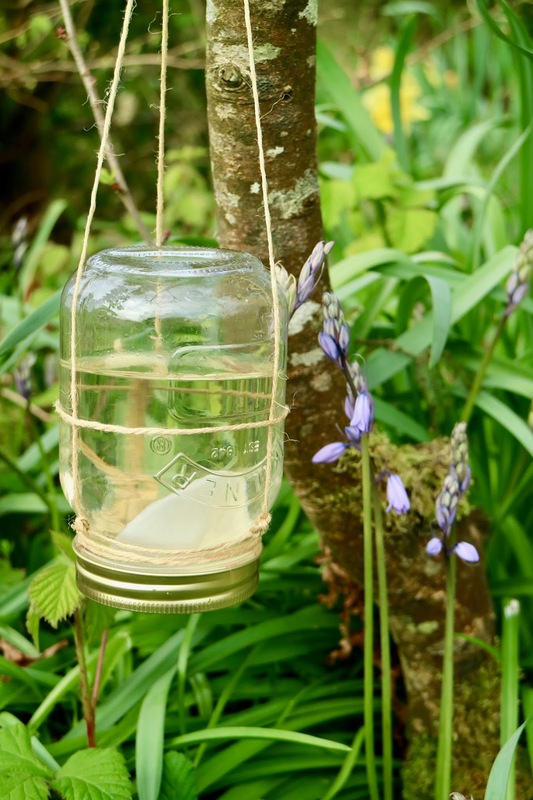 And there you have it- a simple craft that will (hopefully) encourage wildlife and offer a sip of sugary respite to a few knackered pollinators! 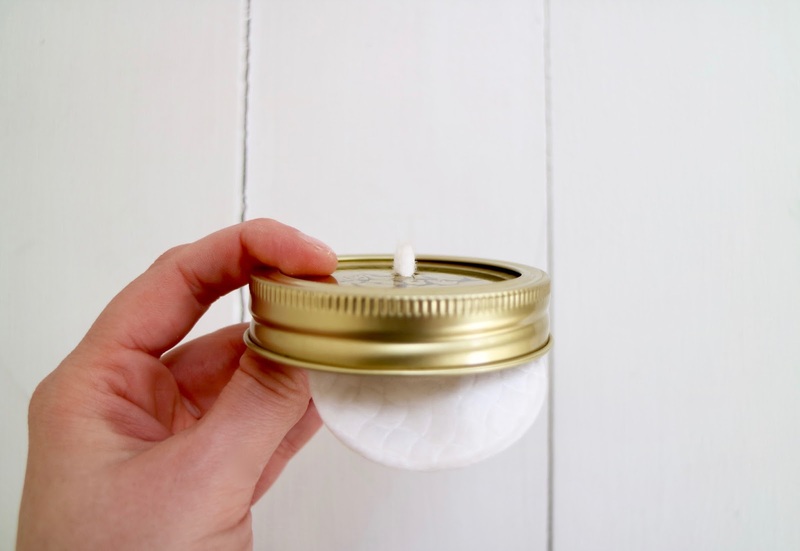 If you give this DIY a go, I'd love to hear about it on Instagram or on Twitter. Let me know how it goes! 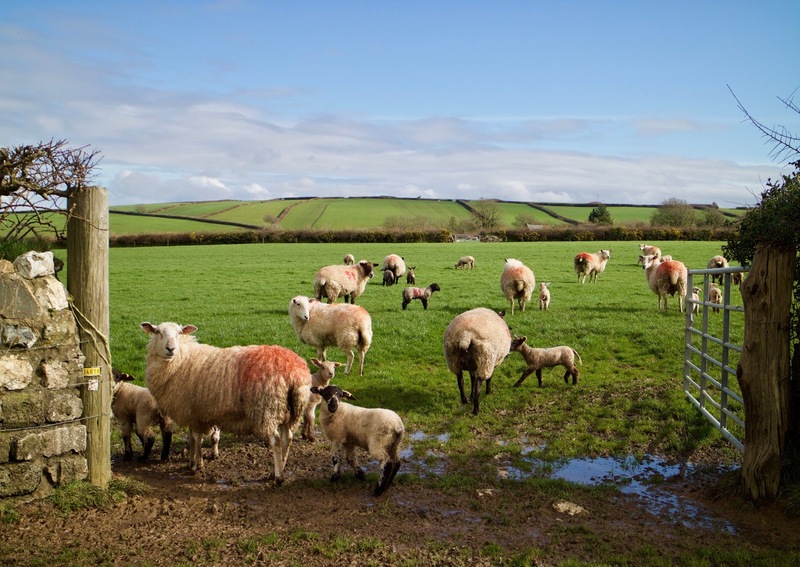 Plus, if you have any further tips and tricks for encouraging wildlife at this time of year, please share them in the comments below. We can all do our bit and I'll certainly keep endeavouring to do mine. And, of course, I'll be sure to keep you all updated on how well this feeder works + whether or not we get a few more pretty visitors! 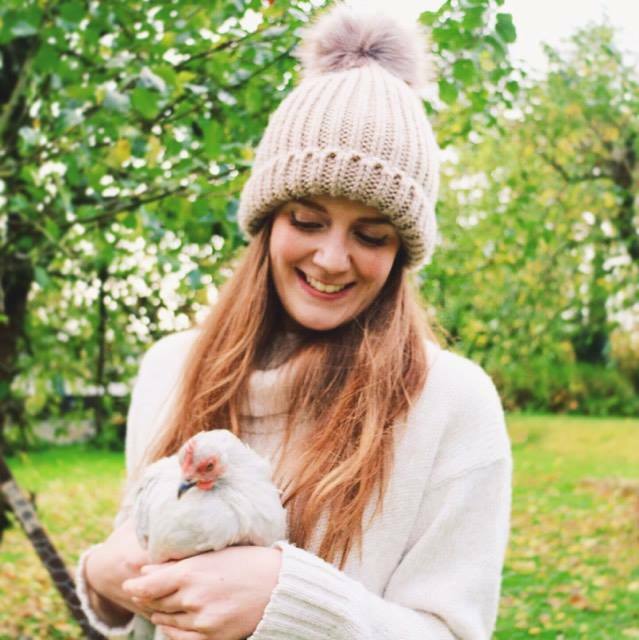 A few months ago, I was tasked by Creative Countryside to create the first in a new series of seasonal vlogs for their online journal. 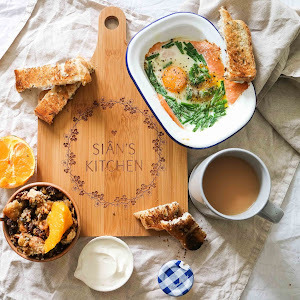 As I've spent some time experimenting with mixing vlogging with my poetry recently, I jumped at the chance to contribute towards such a lovely online publication! You can check out the journal here, and be sure to watch my little film and let me know what you think! You know that feeling when you simply can't believe your luck? Well I got that around about the same time as I took this picture. I was just in complete awe! The Minack Theatre, built in 1932 by the wonderful Rowena (what a great name!) Cade and her gardener Billy Rawlings, is one of the world's most famous open-air theatres. 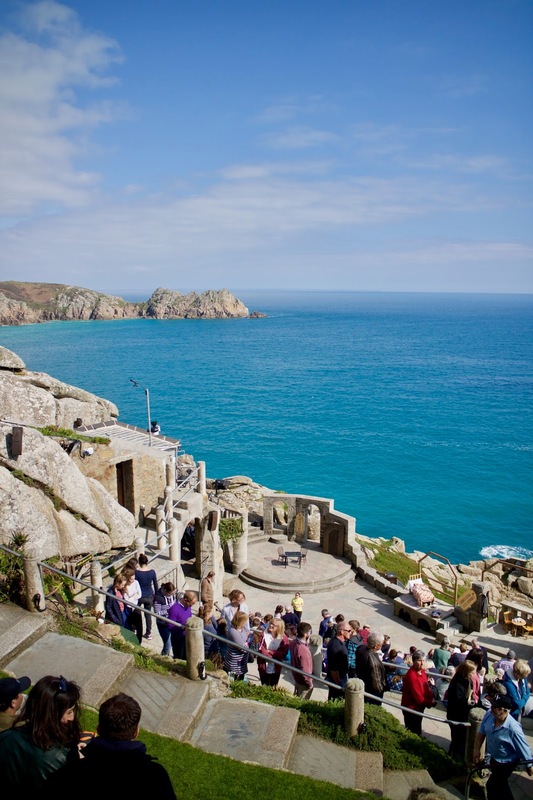 Originally designed by Cade as the perfect setting for a performance of Shakespeare's The Tempest, the Minack has evolved into a home for amateur and professional dramatists alike. I'm sure you'll agree, this isn't like any other theatre! Cade's initial idea behind carving this amphitheatre into the side of a Cornish cliff was for Shakespeare's work to have a fitting backdrop- but that backdrop was what really stole the show for me! Honestly, there's nothing quite like watching a play here whilst the seals down below bob up to say hello and the seabirds circle overhead... bliss. 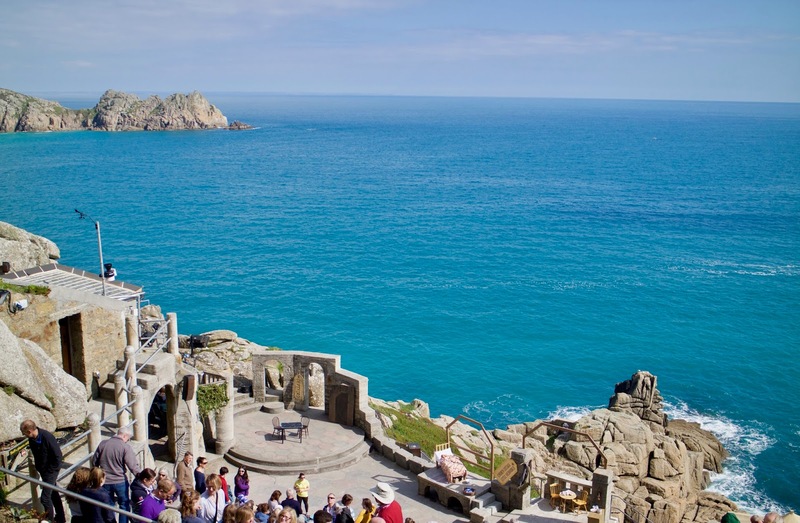 Opening Times: From 1st March until 28th October, the Minack is open daily from 9.30am-5pm. From 29th October until 28th February, the theatre is open daily from 10am-4pm. Obviously, performance times are often outside these hours and the site does remain open for theatre-goers catching a show in the evening! Tickets: General admission is £5 for adults, £2.50 for those under 15, 50p (!) for 11 and under, and little ones under 2 go free! Tickets for performances are anything from £5 to £14, depending on what you're going to see! 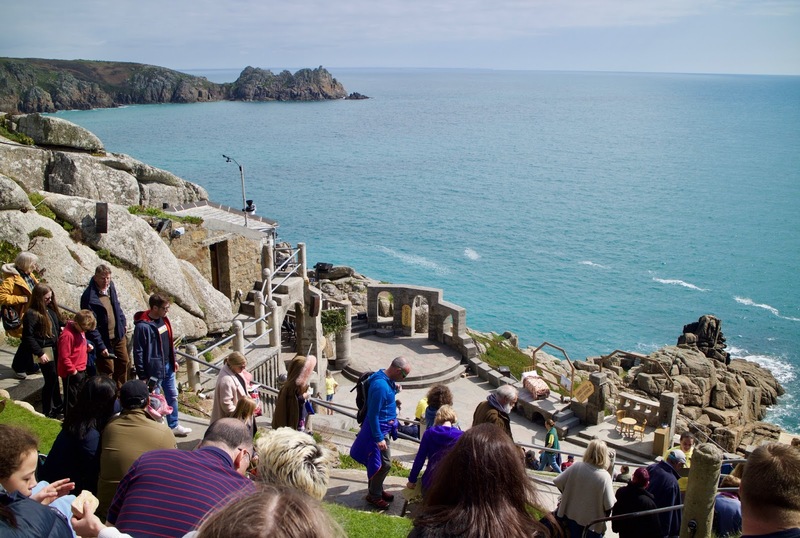 The Minack welcomes dogs during visiting hours but, unfortunately, no four-legged friends (apart from Guide Dogs) are allowed into performances. You must keep your dog on a lead at all times (there are lots of scary drops so you'd probably want to do this anyway!) and, if your pal gets a little parched, you can find a doggy drinking bowl just outside the Visitor's Centre. There's also a designated area of the café for dogs, if you do decide to take a break at any point. 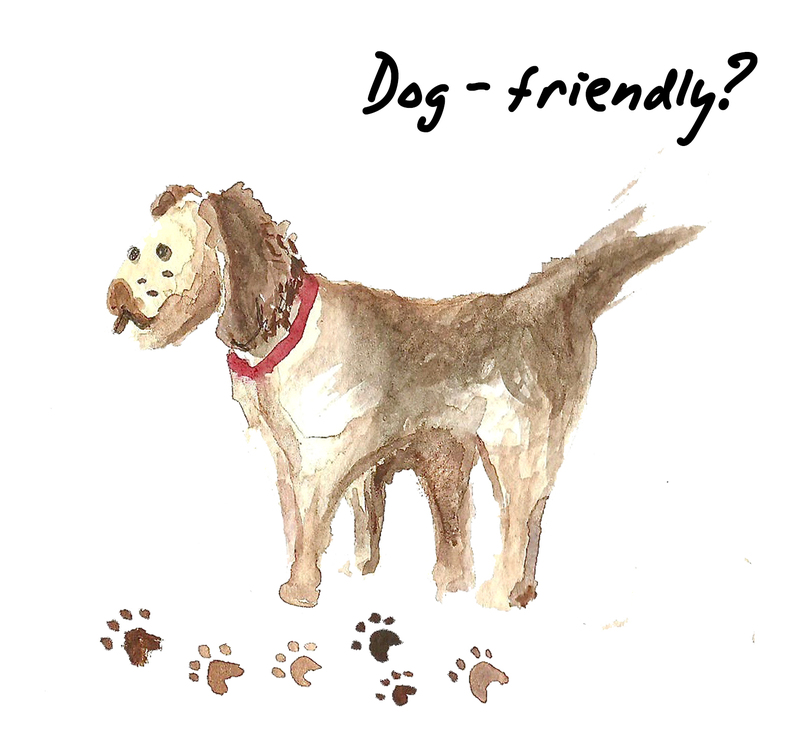 The Minack website also recommends the local pet-sitting service, Penzance Pet Care, just in case you want to enjoy your trip sans dog! 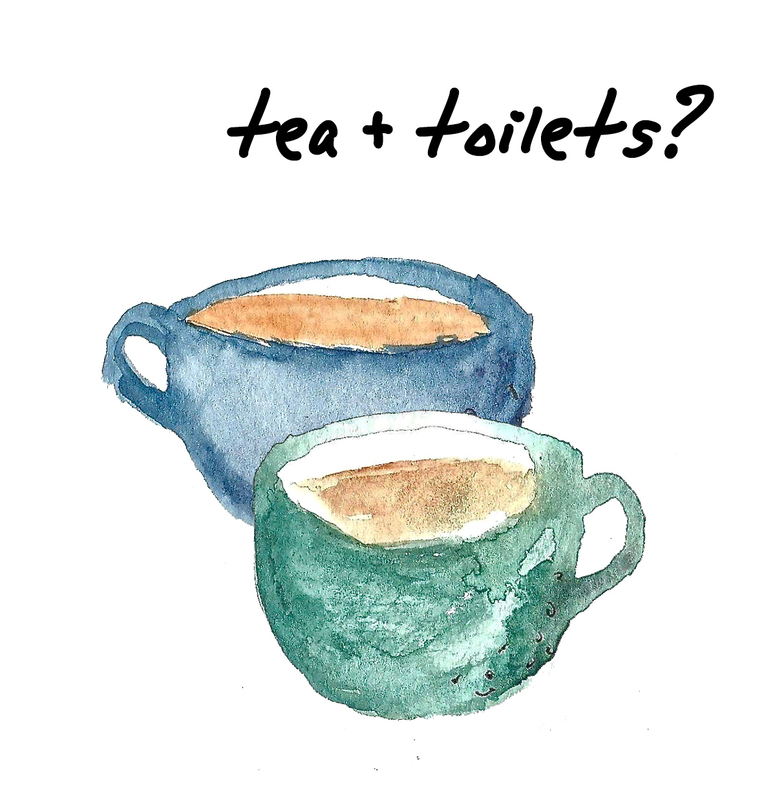 The tea and toilets situation at the Minack is excellent. I must admit, I was a little apprehensive about needing the loo during the performance (lots of tea involved here), as the Minack is no normal theatre and I thought I would run the risk of disturbing just about everyone if I had to get up and shimmy my way out at any point. However, even though I didn't need to pop to the ladies during the play, lots of other people did, and it was lovely to see that they were very quickly guided in and out of the amphitheatre by incredibly friendly members of staff. 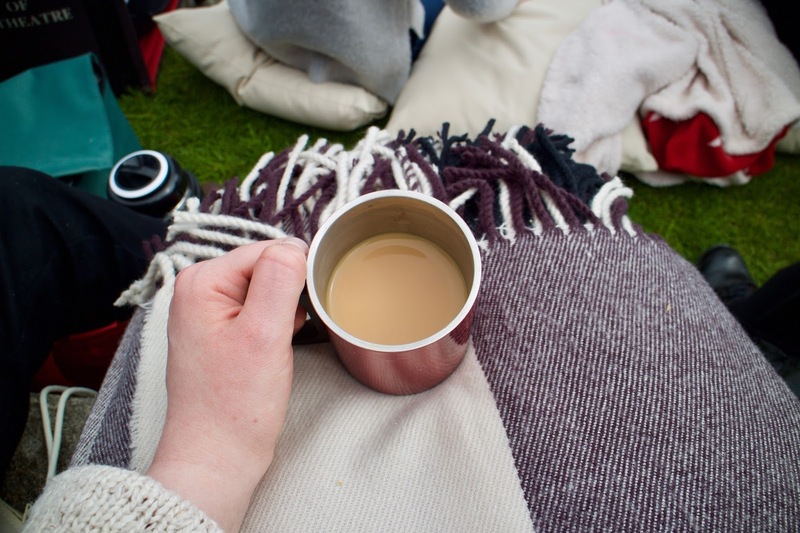 If you, unlike me, are unfazed by drinking gallons of tea in public places, then you'll be happy to know that there are no less than three places to grab a cuppa during your visit! As far as I could work out, there's a hut serving drinks and snacks in the car park, a bigger café on the visitor's level and then a little take-away stall in the actual amphitheatre, which is open during the interval. All of these spots also serve the usual ice-cream, crisps, HUMUNGOUS pasties and fizzy drinks... but, I must admit, these offerings were completely surpassed by the promise of a takeaway from Katie's Hotpots- a stall by the entrance that smelled amazing and was busy serving up little boxes of the most incredible-sounding food. Chicken and chorizo hotpot? Split-pea Dahl with veg and coconut? 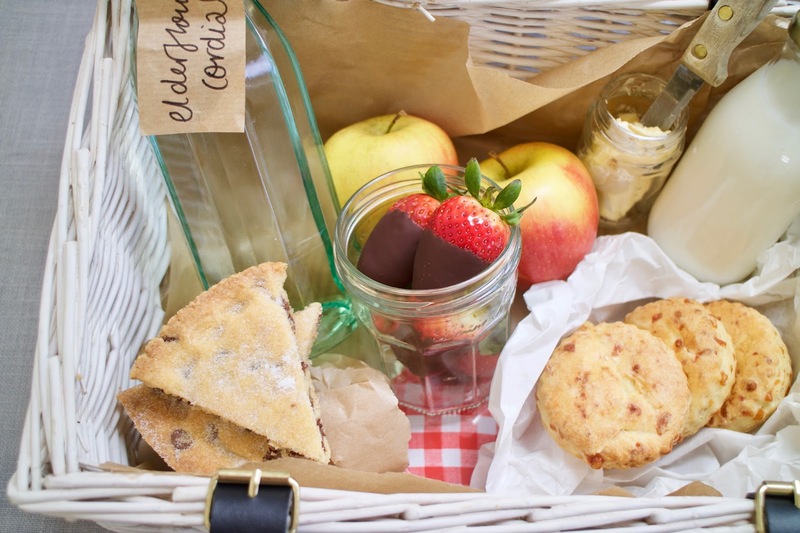 It was almost enough for me to sack off my picnic and grab a box or two! Parking was easy-peasy once we got onto the site. 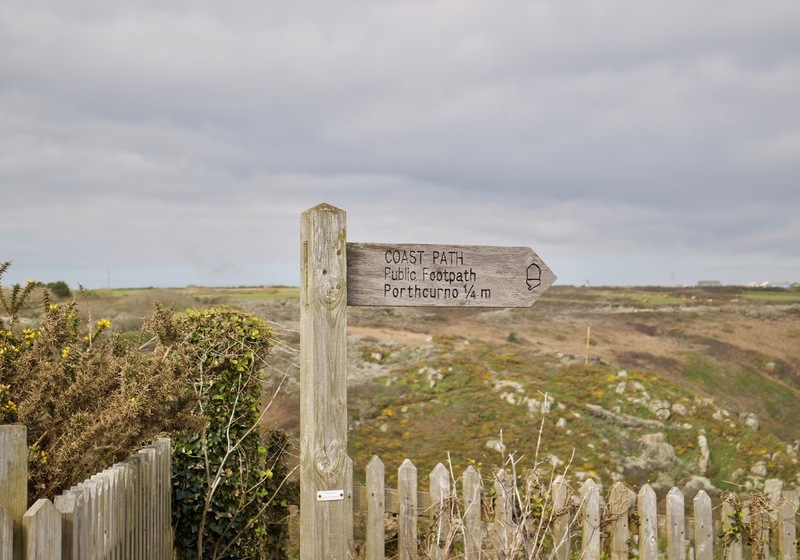 The road up to the Minack is a bit steep and windy, so be prepared for a bit of an uphill, one-way traffic ride before you reach your destination! 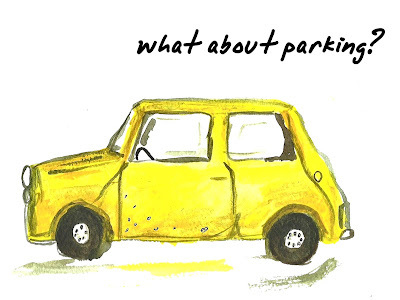 But once you're there, there's no need to worry about parking as you will be swiftly ushered into a spot in the huge car park by a friendly team of staff. There's also plenty of disabled parking bays right next to the entrance and, during our visit when it was quite busy, we noticed that staff were (once again!) really helpful in guiding those with limited mobility onto the site. 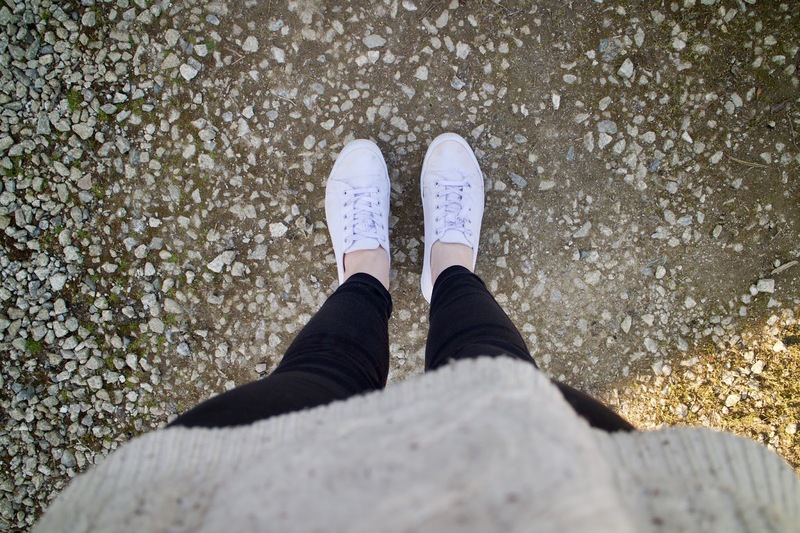 Clothing-wise, I went for my standard ensemble of 'big comfy jumper and jeans' as I'd been advised to dress comfortably and layer-up if possible. 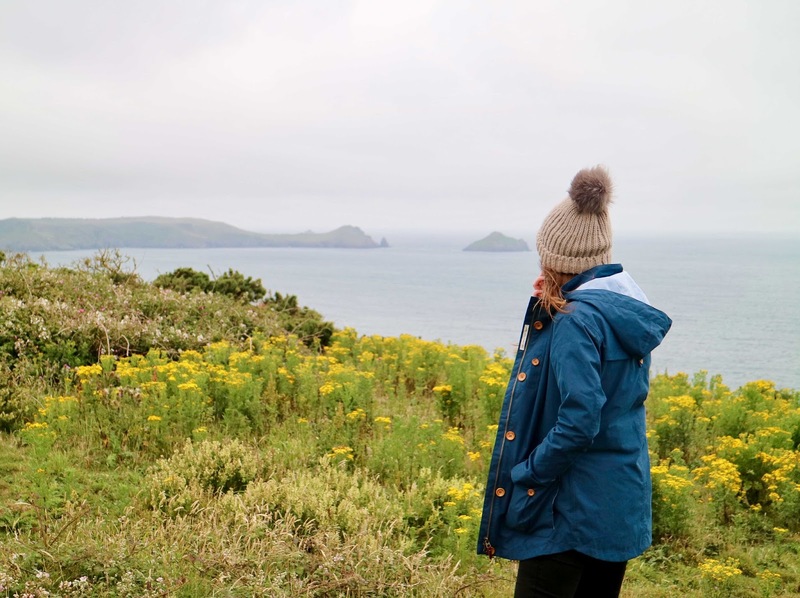 I also took my big ASOS scarf shawl with me as a precautionary measure, and I was certainly glad I did as it came in handy later on in the day as the sky clouded over and the wind picked up a bit! 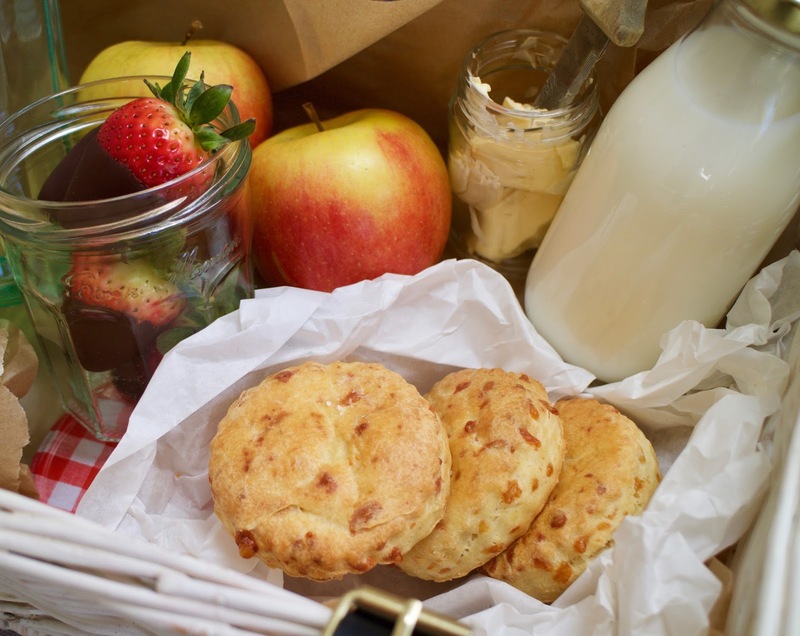 For me, food is an incredibly important component to a successful trip out! 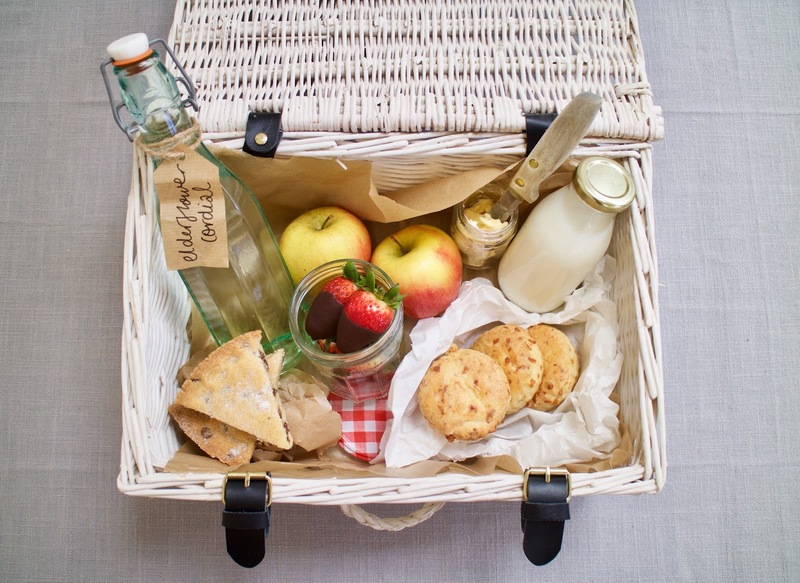 Which is why, when I heard that the Minack Theatre allows its visitors to gather for a show an hour early to settle in and start on their picnics', I knew I had to pack us up a stellar hamper filled with yummy treats! ... and some mini cheese scones. 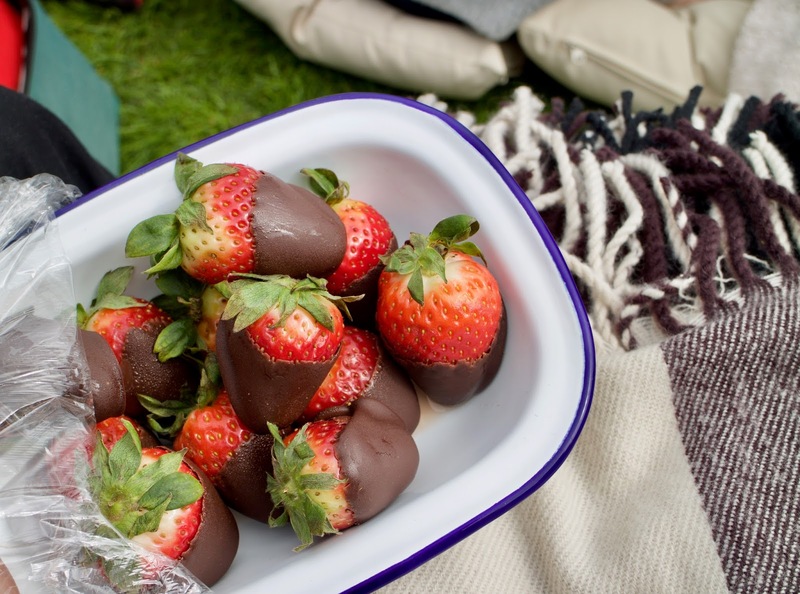 In hindsight, and even though plenty of other people brought hampers of goodies with them, I would say that there wasn't really enough room in the seated terraces to set up your picnic. 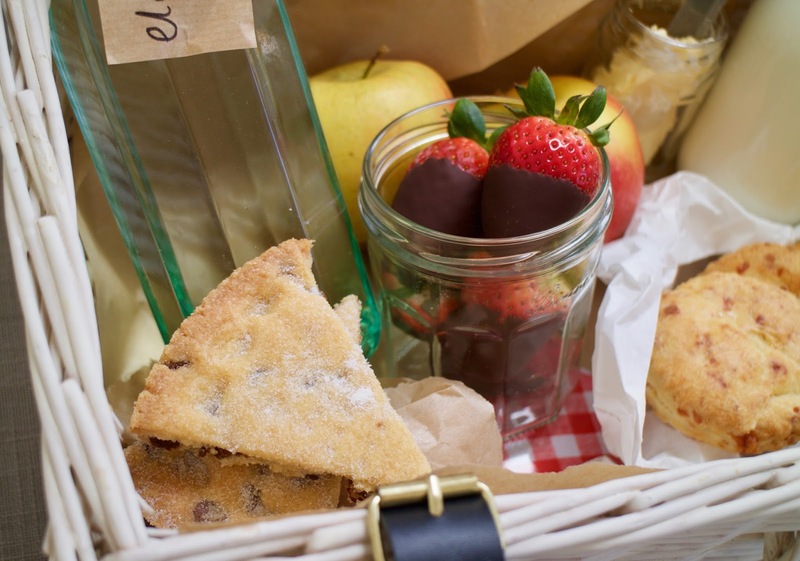 My top tip for picnicking here would be not to bring a big cooler or hamper like we did but, instead, to bring a narrow tiffin or bento box like this one. You want something that can either sit comfortably between you or be swiftly tucked away at your feet without taking up too much room! 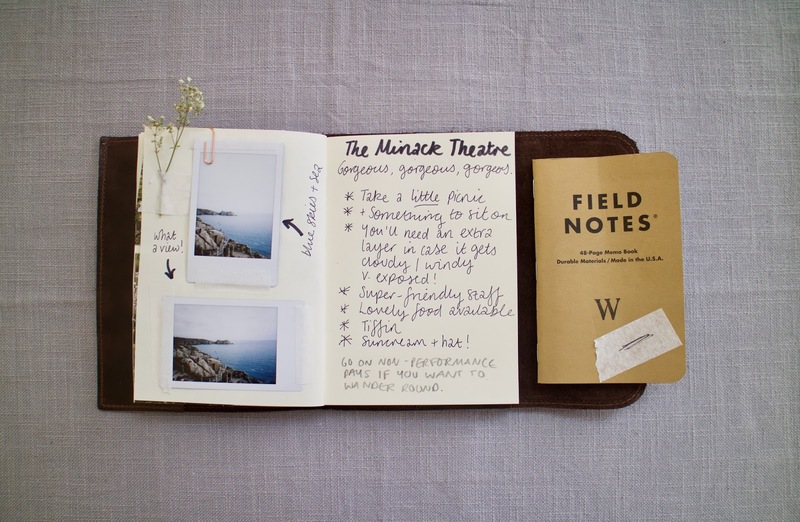 I would also say that it was incredibly hard to take pictures or make notes once seated in the theatre! As it was a sold-out performance, we were filed in quite quickly and asked to sit shoulder-to-shoulder with eachother in the audience- meaning there was very little space or opportunity to get up and take pictures of the theatre or eachother before the show. I had planned to take a little OOTD snap against this stunning backdrop but quickly realised, as soon as we were seated, that the chances of this happening were quite slim! It would have been far too awkward and annoying of me to do this in front of all of those people! I also really would have liked to have taken a couple of pictures of the performance. We saw a production of Goodnight Mr Tom and it was so excellent that I wanted to grab a snap of the wonderful sets and costumes etc. However, I really got the feeling that this would have disturbed my neighbour's viewing, so I didn't reach for my camera at any point during the show! I think this would be my only complaint about our visit- there wasn't much time to explore the site or take in the area once we were all filed in. It was a sort of 'don't leave your designated seat' situation and I did feel a little hemmed-in at points. Don't get me wrong, everything was incredibly well-organised and the whole procedure of getting people seated in time before the play began was handled with magnificent ease and professionalism. I think I would just have liked the opportunity to have a wander without being immediately consigned to my seat! Definitely something to remember before next time. The enforced proximity to strangers, although at first a bit alarming, was actually quite enjoyable for me in the end! I was sat next to a lovely older lady who complimented me on my 'gorgeous' plate of chocolate strawberries and kept making sure that I had a good view of the seals in the water in front of us! Snug as a bug in a rug with a lovely cuppa. 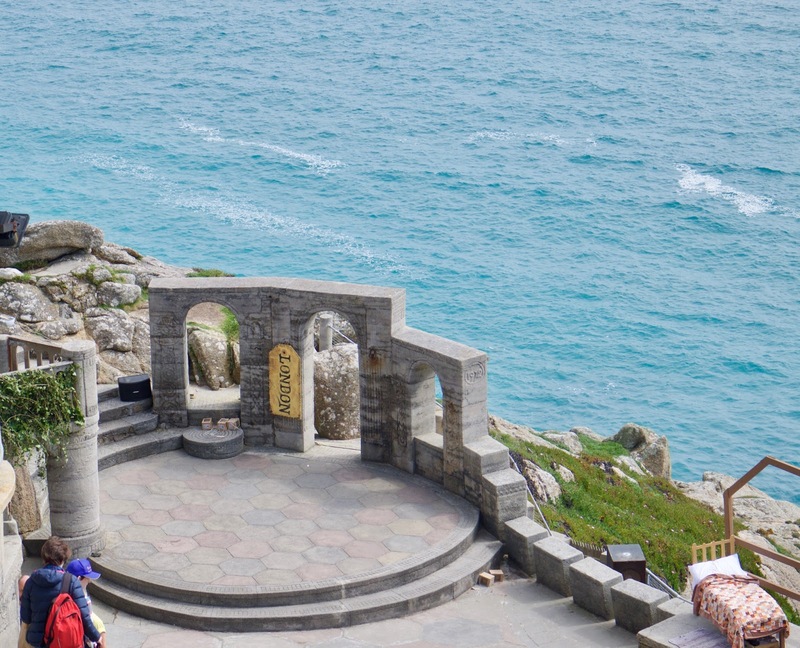 All in all, I absolutely loved my trip to the Minack Theatre and I highly recommend it as a place to visit or even enjoy a play if you ever get the chance to go! 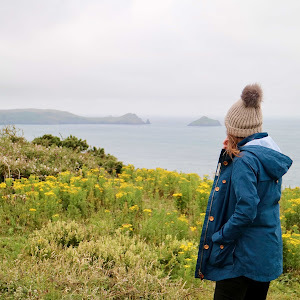 If you bring the right supplies and prepare yourself for a little adventure then it really is the dreamiest location to trek all the way down to the edge of the country to see! We'll certainly be returning soon (hopefully to see a sunset performance of Twelfth Night!) 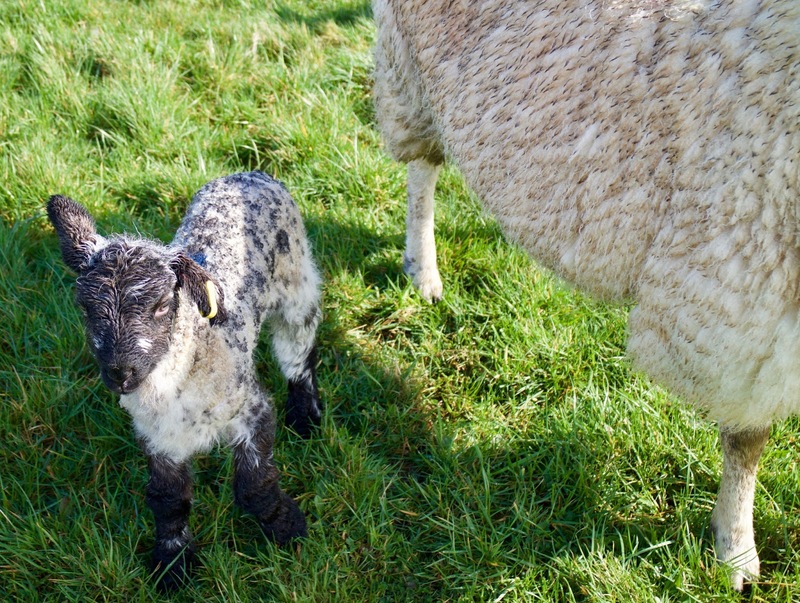 and, cross fingers, I'll be able to get loads more pictures to show you then. Have you ever been to the Minack? I'd love to hear what you thought of it in the comments below, is it always so beautiful?